This stream is a short one. The stream cut through a valley shown by the red arrow. 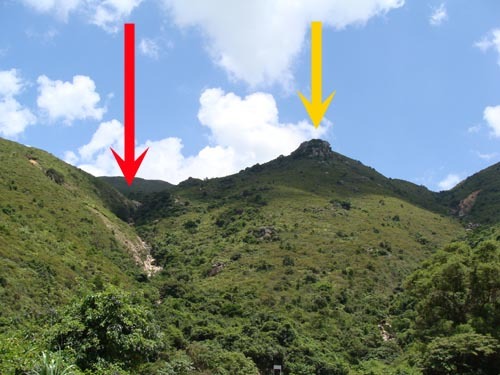 Many hiking groups will take this stream and then pay a visit to Lotus Tower (蓮花塔) as indicated by the yellow arrow. 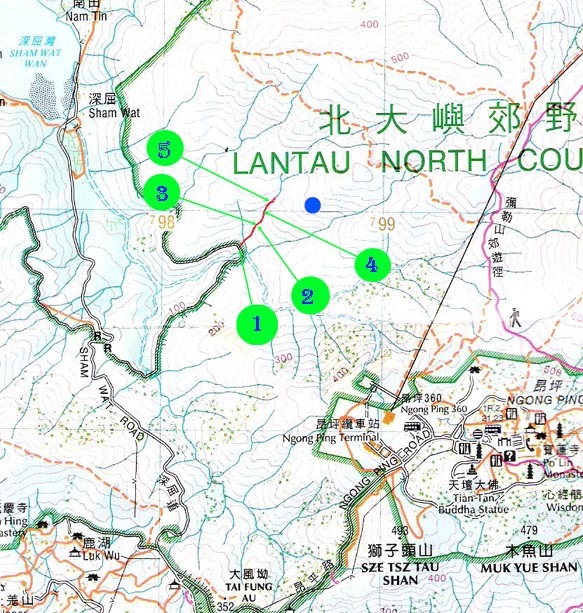 The blue dot on the map is the Lotus Tower which is basically a big rock. There is some waterfalls but not extremely impressive. The water pools are not very big either. The stream used to be a relatively easy one. It changed after a nearby landslide during a major rain storm in July 2008. The landslide altered the exist. That makes the stream a 4-stars-difficulty one. This is the entrance of the stream. This is the first water pool we have encountered. It is rather shallow. But not bad for a dip. 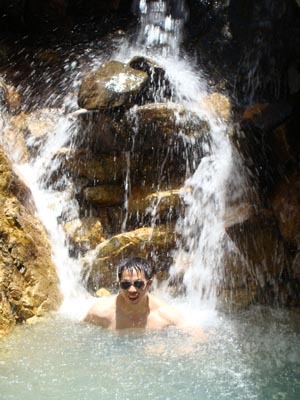 This is another beautiful waterfall above the previous pool. 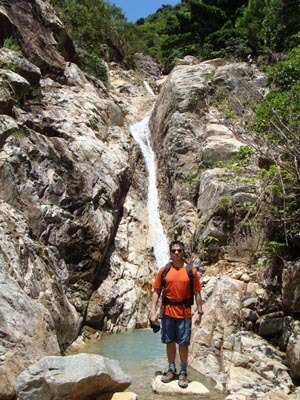 This waterfall is the first real challenge of this trip. There is no comfortable way to overcoming this waterfall. We chose to take on this cliff on wet surface on the right. 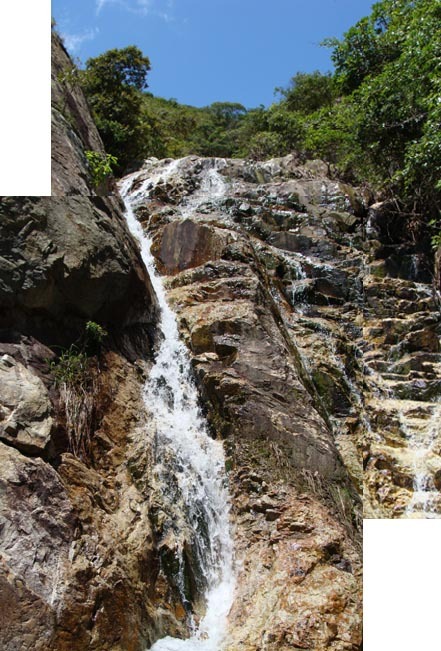 This is actually a weaker waterfall on a stair-like surface. Experienced climbers with a lot of concentration should be able to conquer this. It is not for novice hikers at all. It would be easier in dry reasons tough. 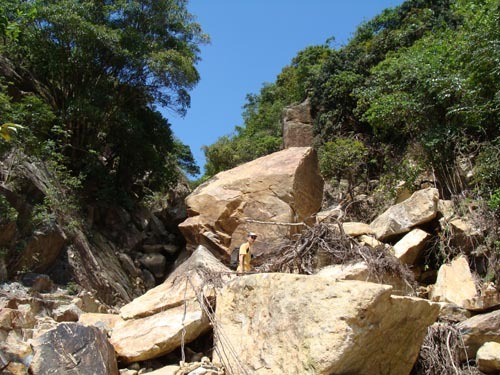 These big rocks are the result of landslide. At about 220M, we encountered a prohibitive cliff. We have decided to choose a seemingly impossible rocky surface on the left to leave the stream. That rocky surface is about 3 meters high. Again this surface is not for the inexperienced. This should be the last challenge in this trip. After that we reached the brushy hill side. We cut across the upper stream and moved towards the Lotus Tower. 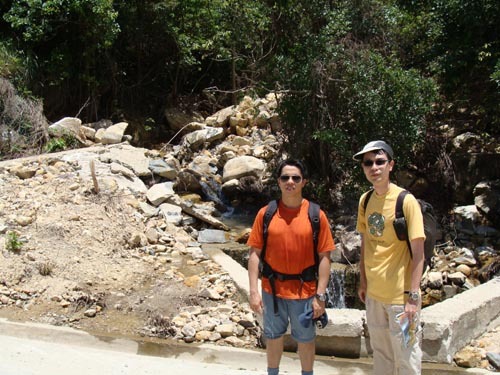 You should be able to find a faint hiking trail near Lotus Tower that lead you back to main footpath. 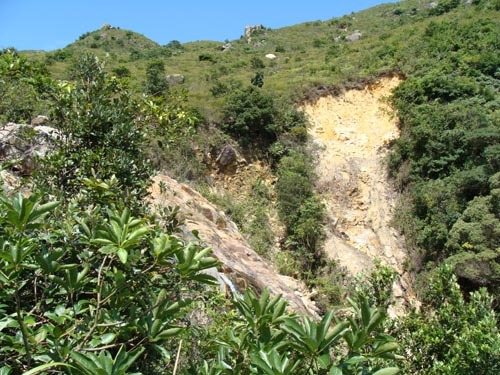 The scar of landslide in the upper stream.